Sudeep D'Souza: Is eating out too expensive ? Is eating out too expensive ? You hear a lot of it in the news that food prices are rising and that people are not able to afford to eat out any more. Today we paid a visit to Paradise Restaurant in Hyderabad and ordered take away (Read my earlier post Food in Hyderabad about why you should do take-away and not eat at Paradise) and here is what we got for a gift pack that costed us Rs. 220. We usually eat Biryani from Hyderabad House and all of the items mentioned above would have costed us nothing less that Rs. 500. A few days ago we ate in Chutneys and for just 1 palak paneer, 4 rotis, 1 soup and 1 plate of idli the bill came up to Rs. 450. Chutneys used to not be this expensive - its only of late that they have really increased their prices. And on the other hand the small idly-dosa tiffin joints that you see all over Hyderabad have pretty much kept their prices stable. Another kind of restaurant that most people eat from is what they call a "mess" in Hyderabad. 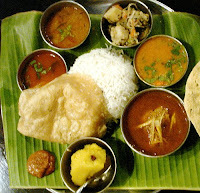 They serve a "meal" in these messes that consist of portions of fried vegetable, curry vegetable, sambar, rassam, pickle, chutney, curd and rice. Three years ago this used to cost Rs. 30 and now this costs Rs. 60. I think this is an indication that yes prices have gone up but they have doubled in the last 3 years but they have certainly not gone through the roof as eating in some restaurants may suggest. Prices have gone up and there is no denying that but if you pick and choose the restaurants that you eat in you can still have a great meal without burning a hole in your pocket. this is quite true of the more up-class joints anywhere. They may utilise the media hype to increase their rates as they know that the people who eat at their place are those who can any afford the meal and mostly do not care about the increases. 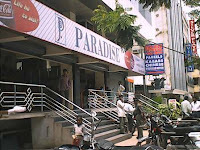 A tiffin joint on the other hand is frequented by the poor to upper middle class folks who are highly price sensitive. Besides, these joints also operate on low margins and need high volumes to make a profit. They keep that in mind and increase their rates only where necessary. I did try the same take-away package at Paradise. The take-aways are good value for money. Shortage of power ? Here is a solution. Why would anyone need a camera like this ? Open ID - What, Where, How, Advantages, Safe ?